As a visitor to Ermioni, we hope you have an enjoyable time. However, for some, there may be a more serious occasion where you may require medical attention. We recommend you take out medical insurance cover during your stay, prior to travelling. For everyday minor ailments, a visit to one of the three local pharmacies may be all that is required. They are all situated on the Limani side: one next to the Piraeus bank, one on the corner on the way to the Health Centre, and one close to the Kanathos cafe bar. They have highly trained pharmacists that speak English and will give you expert advice. Medicines and drugs can be bought over the counter at a reasonable price. Usually, they are all open during the week, but at the weekends only one will be open on a rota system. Should the need arise for a more serious condition, then a visit to the Ermioni Health Centre, 27540 31224 or 6944 422559 is a must. The Health Centre is situated in a building behind the Port Police station, where you will find a good English speaking doctor. The Health Centre is only open Monday to Friday: 08:30 to 13:00. See the plan of Ermioni below, in the picture gallery, for location. Other doctors are available in Ermioni, but by private appointment only, and you will be charged. Should the Ermioni Health Centre be closed, then in the neighbouring town of Kranidi, 10 kms from Ermioni, there is a 24 hour Regional Health Centre (left) Tel: 27540 22222 or 6932 646424 with English speaking doctors on duty at all times. Please be aware, there is a standard 5 Euros cover charge for all patients. There are a couple of pharmacies in Kranidi, see plan of Kranidi in picture gallery below for location. If further treatment is necessary then the nearest hospitals are at Nafplio, 78kms from Ermioni, and Argos, 89kms from Ermioni. Please note: There is only one ambulance on duty for the whole Ermionida area, so it's much quicker to drive to the Regional Health Centre in Kranidi, or take a taxi. Although there are a couple of dentists in Ermioni, we can personally highly recommend two dentists in Kranidi, who both speak English. 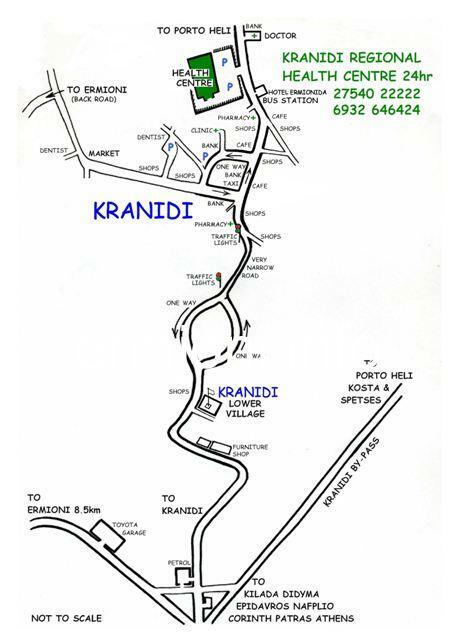 See plan of Kranidi below for locations. Fotis in Kranidi 27540 23425 or 6977 946554. Maria in Kranidi 27540 22500. Due to very little crime in the town, there are no police officers on duty in Ermioni. The regional police station is now situated in new premises (right) at the bottom end of Kranidi, between the open-air market and the new AB supermarket. Tel: 27540 21210 National Police Tel: 100 English spoken. Additional police from Kranidi are usually requested for large events in Ermioni, like the annual 'Dionysia' weekend, or the annual festival at the Monastery of Agioi Anargyroi, on the outskirts of Ermioni, where thousands of pilgrims attend on the last day of June. Local issues and traffic disputes within Ermioni are usually dealt with by the Port Police. The Regional Municipality of Ermionida Town Hall (Dimos) is located in the old town in Kranidi and covers the whole Ermionida area including Ermioni, Kranidi, Porto Heli and Kilada. Local and government issues can be directed to this office. Ermioni - Kranidi - Porto Heli area: Yorgos - Tel: 27540 22348 - Mob: 6946 413 865 Office/Surgery location: Kranidi. Kranidi - Porto Heli - Ermioni area: Nikos - Mob: 6977 585 596 Office/Surgery location: Kranidi. Ligourio - Epidavros area: Kaikilia (Kelli) - Tel: 27530 22929 - Mob: 6979 449 263 Office/Surgery location: Ligourio. Nafplio - Tolo area: Dimitra - Tel: 27520 22965 - Mob: 6981 487 615 Office/Surgery location: Nafplio. Argos area: Haris and Eleni - Tel: 27510 25333 - Mob: 6944 381 892 Office/Surgery location: Argos. Most pharmacies have animal medicine available that you can buy over the counter.